Towerblock in my town? don't be so uncouth. I was born in Purley hospital but even I would have to say that describing Purley as 'leafy' is like describing Brighton beach as 'sandy'. Apart from the centre of Purley, where it is most built up, it is very leafy elsewhere, in all directions from the centre. To illustrate the 'leafiness', here's Purley/Croydon from above at the same magnification. The green bits are, surprise, surprise, leaves. This is actually a valid point. What a lot of residents would object to is being in their garden, yet above the tree-line and in their eye-sight they would have a giant block leering over them. The reasonable / sensible suggestion would be to be allowed to build up to the tree-line of the area in order to keep people happy with developments in their town. Any higher than that and developments look out of place, unless they are built in areas already with high rises. All this speak of leaves...does leaving Europe mean this building wont happen? If Brussells MEP's get to 'punish the UK' with freedom of movement (aka uncontrolled immigration) or according to Cameron, 'we pay the costs of staying in the single market' (keeping freedom of movement), then the answer is, as you know, probably not. The language is very telling. If there is a general election and not a 2nd referendum now that weasel Jeremy Hunt isn't standing, this is the kind of thing someone hoping to negotiate hard should use. I'd be surprise if UKIP didn't. The proposed building is too high but Developers do this to give council planners room for manoeuvre . They put in planning a few years ago (I'm not going to look it up so may not be exact ) for a 10 story building which everyone complains about . That was turned down . They now put in a plan for 17 story building which everyone complains about and the council knock it back . They then declare they have carefully considered (vote for me next time )residents feelings and told the developers they can only have a 10 story building which is what they want anyway . Everyone's a winner . Progress though you cant stop , whatever they say Gatwick will be expanded in years to come . The A(M)23 corridor will be prime real estate and Purley if it plays its cards right could become the front door to London . There is also the option of writing to Croydon Council - at this stage it will have to be by e-mail. Thanks for the support I know you will give. Thank goodness for that. At last hopefully this monstrous proposal will be studied properly at last and rejected as it stands. 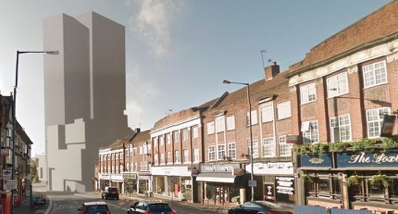 The fear for Purley is that should this building be allowed to go ahead it will open the flood gates for more applications of buildings approaching the heights of 17 stories and then Purley will start to look like the middle of Croydon which considering its size would be a bit of a disaster! I agree the site badly needs developing (has done for years) however 'sympathetically' and 'aesthetically pleasing' need to be incorporated into the design stage before it is built and 17 stories rules both of these out for a start. Purely is already a disaster. Something needs to change there drastically. Glad to hear this has been given the boot. The place is unrecognisable now. The best way to describe it would be somewhere on the south circular. South Croydon is more peaceful than Purley and that isn't an exaggeration. South croydon has a road going in 2 directions. Purley has 5 roads meeting at 1 junction, 3 roads going in 2 directions and 2 one way roads with 1 being huge grief.